The following process entails creating your transcript, exporting it to the Facebook-compatible SubRip .srt format, and finally uploading your video along with the .srt file to Facebook. Note that, at this time of writing (February 2017), adding captions is only available in the US for the English language, and it won't work on mobile or tablet. This is subject to change as Facebook continues to develop their video features. In the likely even that Facebook alters their subtitling process, we'll try to keep these instructions updated. Open up InqScribe and prepare your transcript with text and timecodes. Once its ready, export your transcript as a SubRip .srt file by selecting "File > Export > SubRip Format." Select a name for your file and specify its save location with the "Choose..." button. Here's the important part: Facebook requires you to place ".en_US" at the end of your filename. So, your file will end up looking something like "Example.en_US.srt." Now, in the Export Settings menu, click "Advanced" to bring up the Advanced Options. Set Line Endings to "Windows (CR/LF)" and click OK. Don't forget this step! In our testing, Facebook will only accept Windows and Unix line endings. Press OK and your SubRip .srt subtitle file will be saved in the location of your choosing. 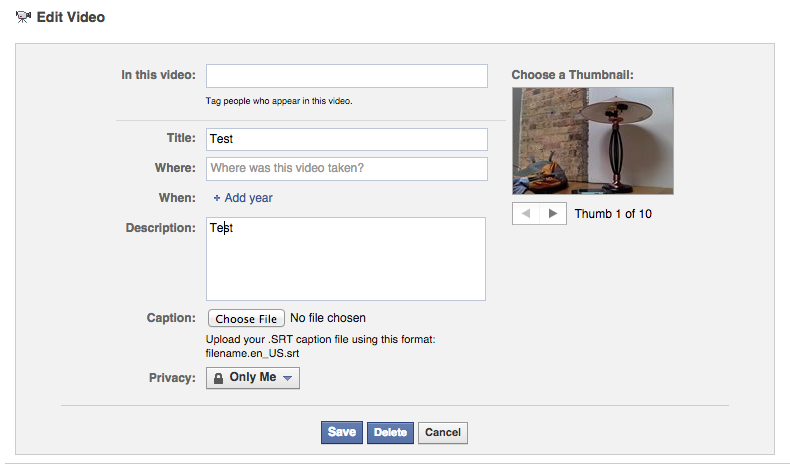 Now, login to Facebook and upload your video (instructions from Facebook here). Once you have located your video, select "Post" and the video will begin uploading. Then, select "Edit This Video." You'll be taken to the menu pictured below where you can add in your subtitle file. Under the Caption section, select "Choose File" and locate your SubRip .srt subtitle file. Select "Save" and the subtitles will be added to your video! To display subtitles, press the "CC" button at the bottom of the video player on playback. If you didn't name the .srt file correctly, you'll see the message "You uploaded a .SRT file with an incorrect filename. Please use this format: filename.en_US.srt"
If you don't see any subtitles after uploading your .srt file and clicking the "CC" button on the video player, then you might not have selected the correct line endings in step 4. You can also add subtitles to a video you've already uploaded. To do so, select the video and expand it. Click "Options > Edit This Video" at the bottom of the video player and refer to steps 7-9.